Today is Labor Day!! 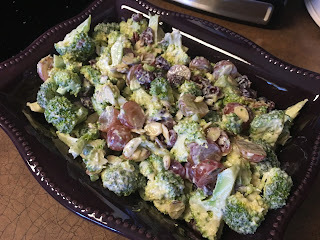 Since me and Eddie have been gone all week for his Friend Joe's Wedding we are going over to Eddies Mom's instead of hosting ourselves so I decided to make a Broccoli Salad to bring along. 2. Stir in broccoli, and remaining ingredients. 3. Transfer to a serving bowl then Cover and chill 1 hour before serving. Facebook Food Videos are how i have been finding a majority of my new recipes lately. 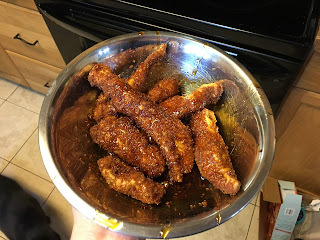 When a recipe popped up for Copycat Chili's Honey Chipotle Crispers I knew I had to try it as these are one of Eddie's Favorites from the restaurant. 1) Make the Honey-Chipotle Sauce by combining all ingredients in a medium-sized saucepan over medium-high heat. Whisk and bring to a boil for about 2-3 minutes, letting it reduce. Remove from heat and set aside to cool.